Michael Stelzner of White Paper Source recently released a study on how marketers are using social media to grow and promote their businesses. Nearly 900 marketers were surveyed. 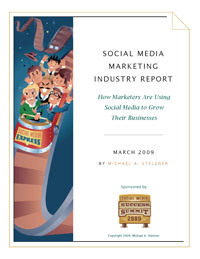 One of the great questions in the study was an open ended question that simply asked, “What question about marketing with social media do you most want answered?” The question only allowed one answer and was designed to reveal the most pressing concern people had on their minds regarding social media. The 685 responses were then clustered into groups and ranked. The responses likely mirror some of you own questions regarding social media and reflect people wresting with selecting the right tactics, measuring the effectiveness of this new media, and how to effectively use it. Business owners were more likely to use social media marketing (90+%) than employees working for a business (81%). For those of you wresting with whether decision makers are using social media, that finding may make you rethink some things. 72% of marketers have either just started or have been using social media for only a few months. The race to understand and effectively use social media is going to continue—and it’s going to continue to speed up. It’s not slowing, and it’s certainly not going away. Owners of businesses with 2-100 employees were the most experienced social media marketers, with 29% stating they have been doing social media marketing for years. 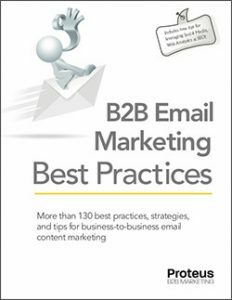 Although this report wasn’t solely focused on B2B, two things stuck me here from a B2B perspective. First, while many of you may sell to big business, the vast majority of businesses are relatively small businesses, and a 50-100 person firm often has significant purchasing power. If your primary prospects are in that small to mid-size market, many of the owners of those companies are using social media. Second, it confirmed to me that larger businesses are still wresting with how to work with social media and have been slower to adopt it. They’re going to be more cautious than smaller enterprises, and that caution can give small to medium size marketers an advantage. 64% of marketers are using social media for 5 hours or more each week; 39% for 10 hours or more. The median for people using social media marketing for years was 20+ hours per week. Social media is not free. While you’re not paying for hard costs, like advertising placement, it requires a dedication of time and talent to create great content, to engage in conversations, and to continually learn. Nearly 80% of those engaging in social media marketing for years noted improved search engine rankings as a benefit. It’s a great side benefit, and if you know how SEO works, you can make sure you’re leveraging your investment in social media to ensure this happens. About half of the respondents found that social media generated qualified leads. More than half of the respondents who had been doing social media for only a few month and dedicating only 6-10 hours of week said that social media marketing generated qualified leads. 62% of marketers using social media for years noted that it helped them close business. The takeaway here is that it does not take long to start seeing some results, and that the longer you engage in social media marketing, the more results you’ll see. It was great to see the majority of experienced social media marketers note that social media has helped them not only get leads, but close business. I’ve long been a proponent of social media and SEO for B2B marketers. For years, B2B organizations have been primarily sales-driven. This has significant limitations when it comes to new business. So much time is devoted to finding and qualifying leads, and, proportionately, so little is spend on closing them. Social media, especially when combined with SEO, can delivery incredible results for B2B organizations, so that time is spent closing business, rather than finding it. Social media and SEO can help get you found early in the buying cycle—it one the reasons we developed expertise years ago and started a division specializing in B2B SEO. But social media and SEO can also help you from a positioning perspective—not only helping others find you, but helping other see you as one of few credible substitutes in your particular niche—and that can help you actually get the business. The report is filled with lots of other great information. Download it and check it out. Thanks, Michael! It is indeed interesting that the it is mostly business owners (rather than employees of those businesses) using social media. That would seem to confirm, of course, that “decision makers” DO use it. Only problem is that this leaves the impression that lots of potential owners and C-suite occupants are roaming the virtual halls, looking for what you have to sell there. While the lead stats support that to a degree, I believe at this point most of those owners and top execs are using social media to sell what they have to sell more so than to buy what YOU have to sell. Doesn’t mean you can’t market to them; they ARE in the arena. Just be careful not to picture those stats as large ranks of eager prospects. We’re getting there, but not just yet!